Here’s what’s been happening, oh Hub City Geeks. 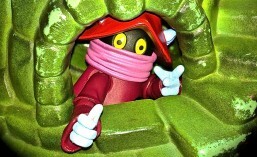 I hope to return to the Blogosphere. But I really need to monetize this blog. I get tons of hits on my MTG reviews. Everyday as many as 60 people. Which is super good, considering I haven’t written anything since April! (Today is November 17, 2018.) . It costs money to review stuff. I don’t get free samples or anything like that. Add to the fact that I have filled up all of my WordPress gigabytes with photos, meaning they want me to upgrade. It also appears that almost none of my other reviews get alot of hits. So maybe I will only cover Magic the Gathering? I purchased two of the Guild Kits and took pictures for reviews. But I just don’t know if it’s worth it. I am thinking of reviewing them, and seeing if I can get positive responses. Also, I have purchased Pokemon, Let’s Go! Pikachu. I’ll see about reviewing that, and maybe some other Nintendo Switch games. Anyways, Hub City Geeks. I am going to try and come back. Be on the lookout for reviews of Dimir and Galgori Guild Kit decks, and Pokemon Let’s Go Pikachu! Because it is pretty hard for non Magic players to know what to get Magic players, I was told I could just order what I wanted. 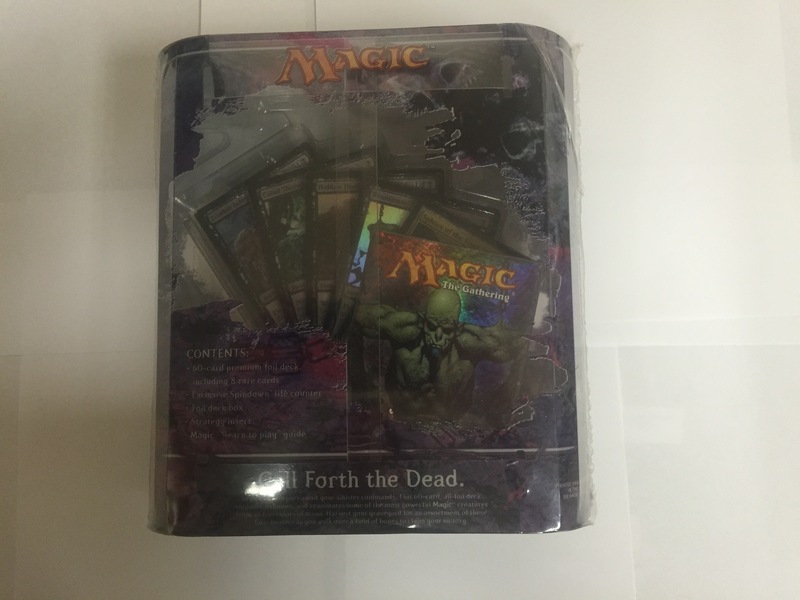 So I ordered “Graveborn,” a Legacy MTG deck from 2010 or 2011. 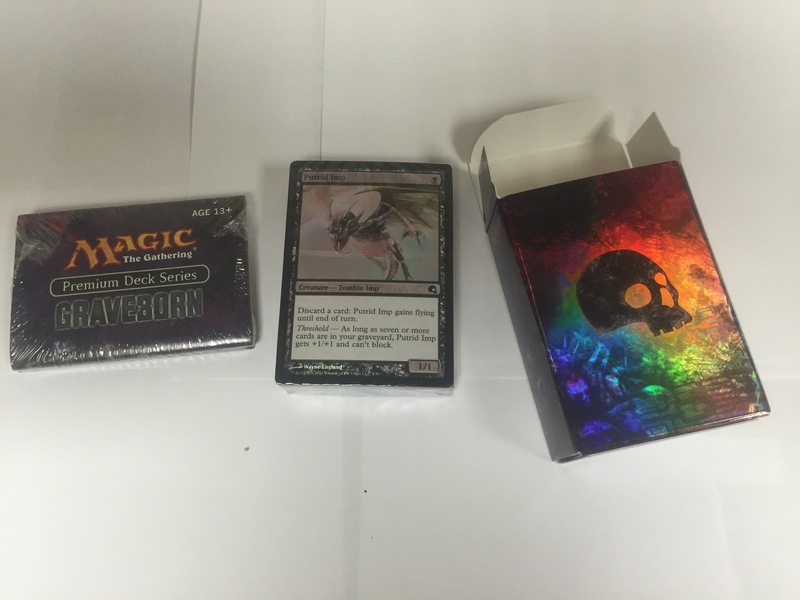 It looked pretty sweet on the internet, and the allure of all foil swamps hypnotized me into making the purchase. 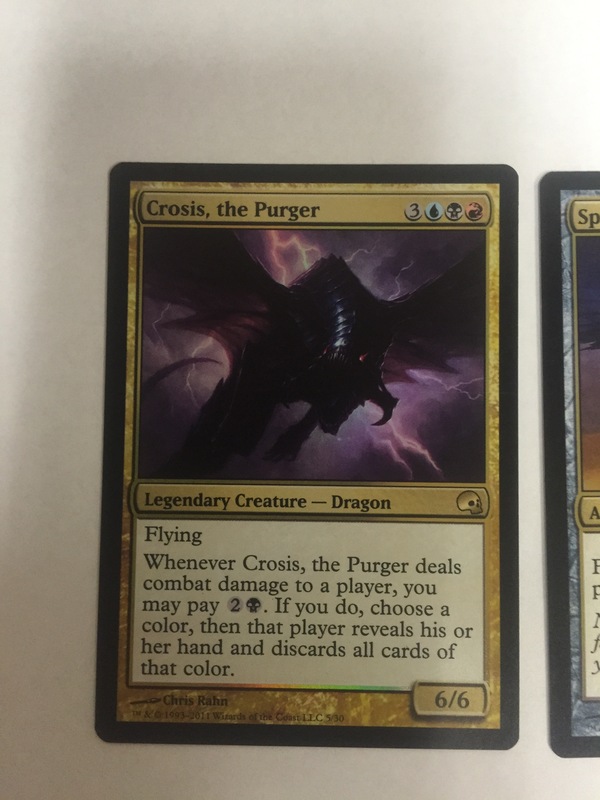 Have I found it to be worth the $83.00 paid through TCGplayer? Keep reading to find out more! The package looked like this. A transluscent tube of plastic that let you see the of the most important cards in the deck. 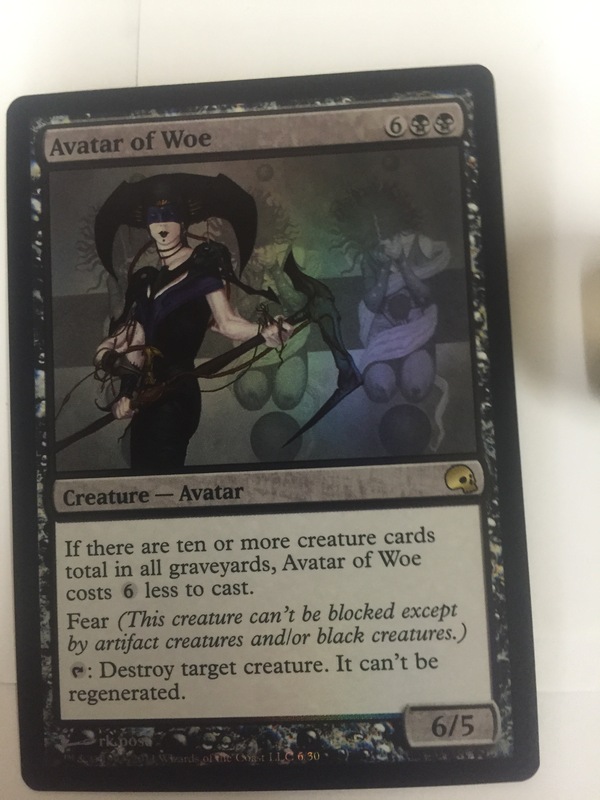 Featured as spokeswoman is Avatar or Woe…a card that could be Legendary, but isn’t. 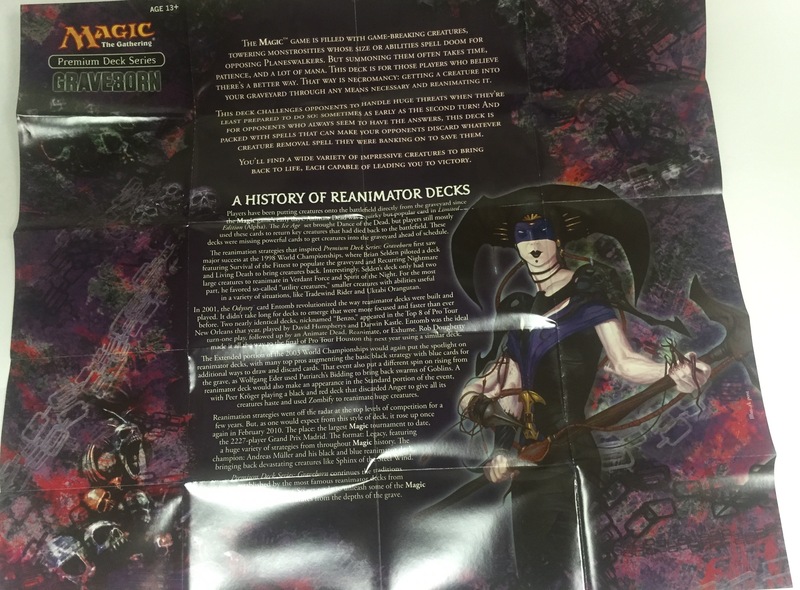 On the back, you can see the deck box, which is also notably foil, with the Reanimate art prominently featured on the packaging. You also get some inspiring messages and a contents list. The deck was wisely cellophane…This tube of a package would be no trouble for a dishonest person to hack. But I’m just throwing away the packaging, right! Opening the box, you see this. The spin down life counter is visible. Removing the product from package lets you see all of this. 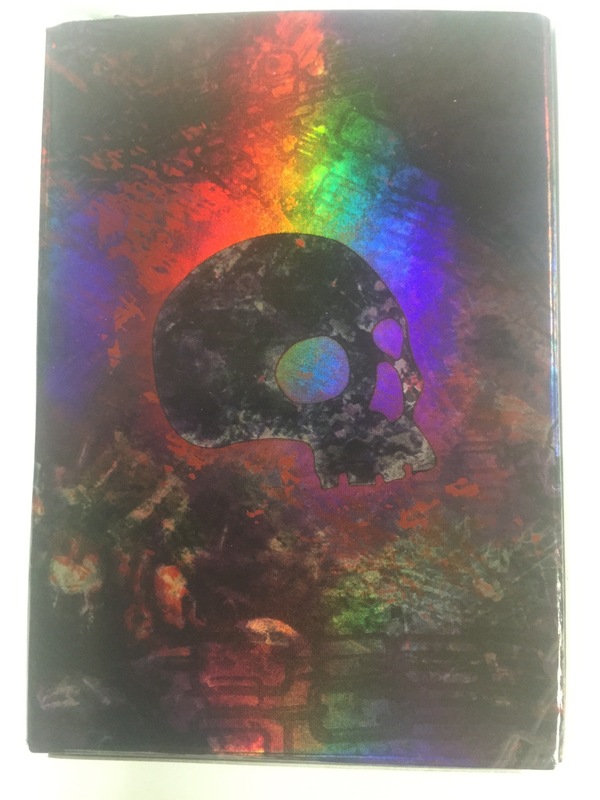 Have a look at the foil detail! The box has nice foil…as mentioned. This card really shows off the foil. 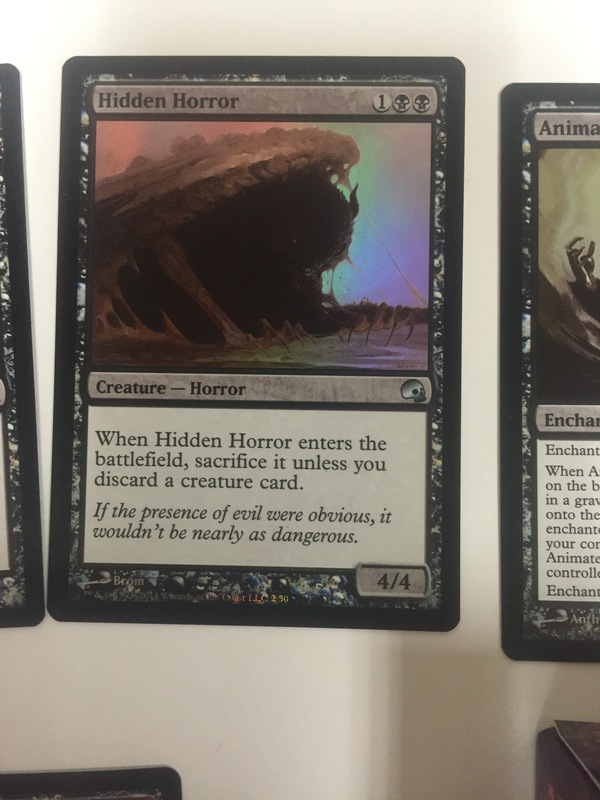 This foil is a little better than what we usually see. It might be equivalent to what they put on Planeswalkers in the Dual Decks. I wanted to mention that the spin down counter feels a little chalky. It is also a little bit lighter than the kind we had before Dragons of Tarkir. 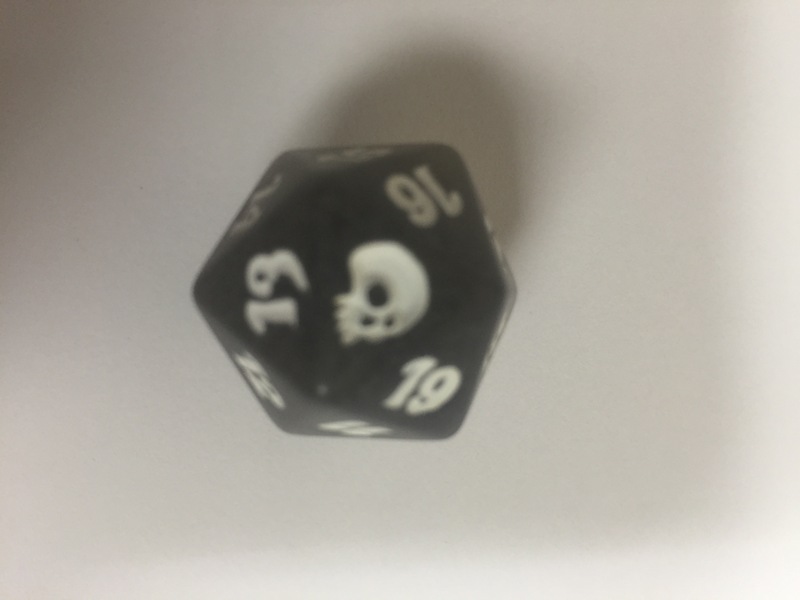 But it doesn’t feel like the dice that came in those pre-release boxes. It doesn’t feel like the dice that came in the Dual Deck Anthology either. I am going to go over each card featured in the packaging. 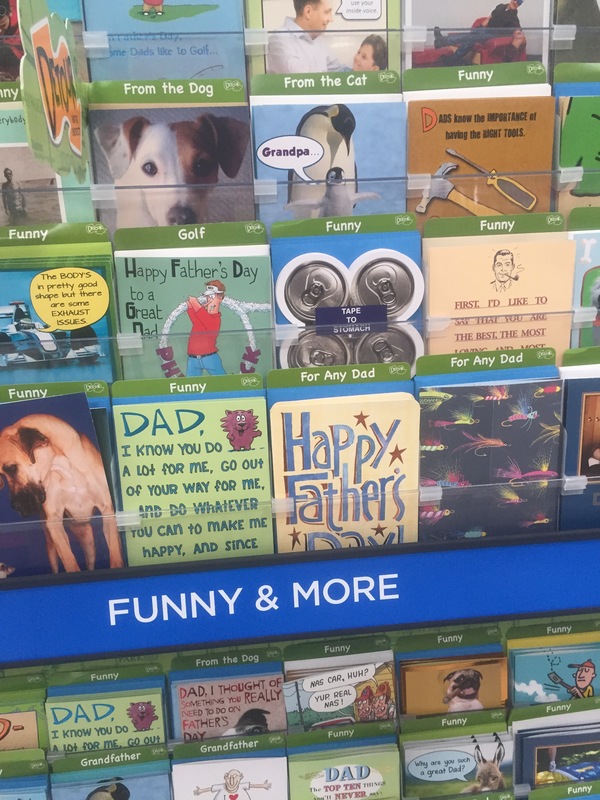 This is a handy card. This deck needs ways to discard things from your hand. In this case you are rewarded with 2/2 Zombie Tokens. You will probably just use them to block on the ground or as things to sac. The Avatar of Woe is good as a beater…but better as reliable removal. 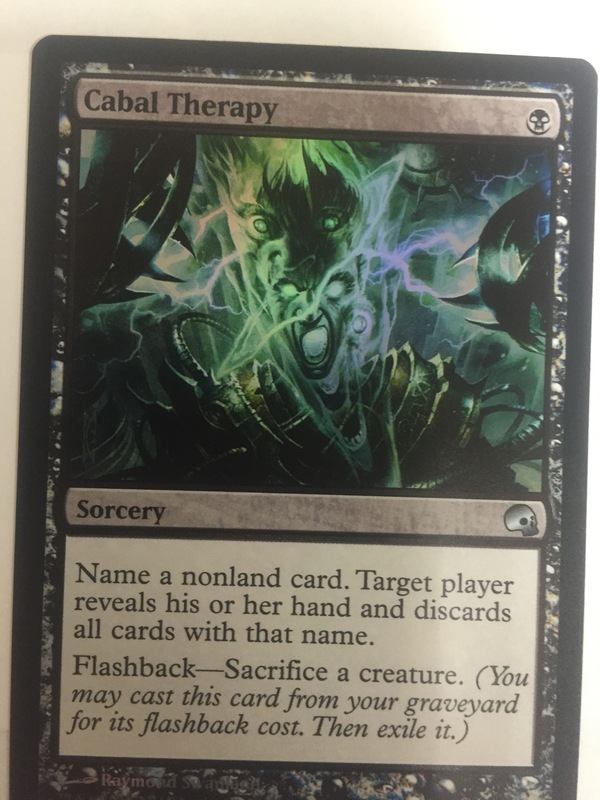 Cabal Therapy. I had this card before, but not with this art. 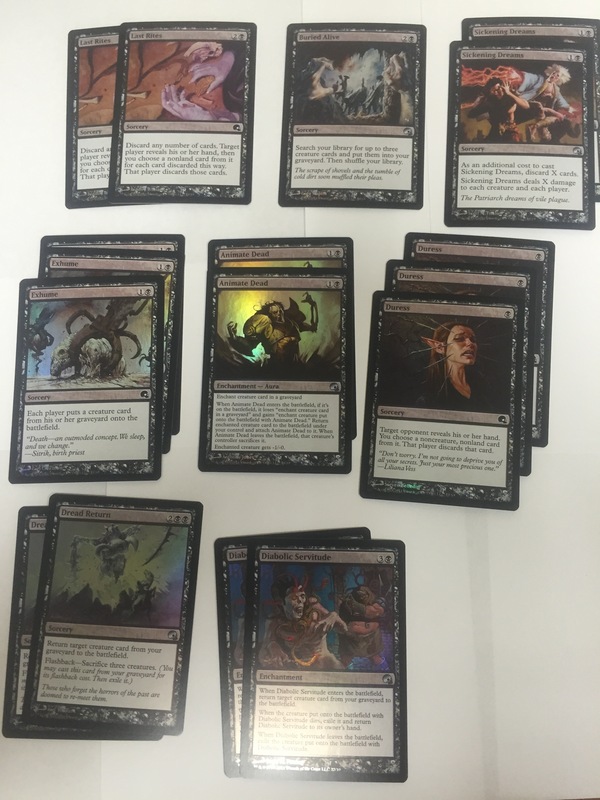 I have only played it in Commander…it is a fun card with a lot of utility. You can use it as a Thoughtsieze effect, or you can target yourself and get one of the bombs out of your hand into the graveyard. It’s just fun! 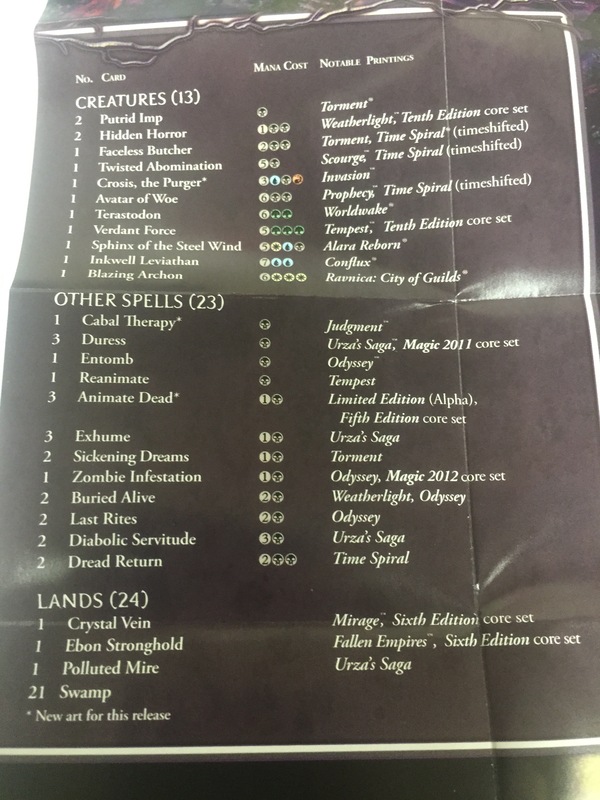 Someone recently asked if the wizards would be reprinting this for Standard. I wonder why they wouldn’t? Of all the cards in this deck, this is the most “money card” of them all. Priced at $30 or roundabout. 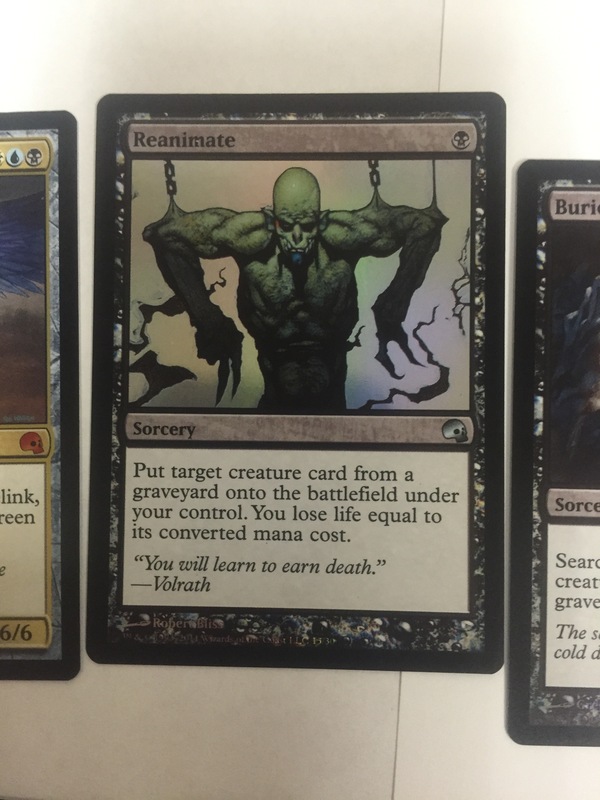 You can get whatever creature you NEED and put in your graveyard for re-animation. And at instant speed too…so you wait until they are tapped out, then drop this bomb. 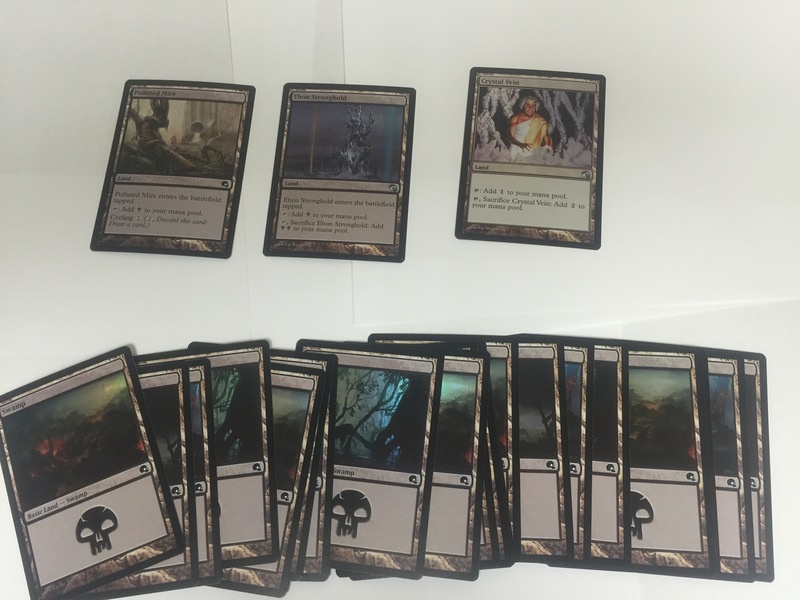 Reanimate is banned in Modern for a reason…One mana to get back whatever bomb you have. 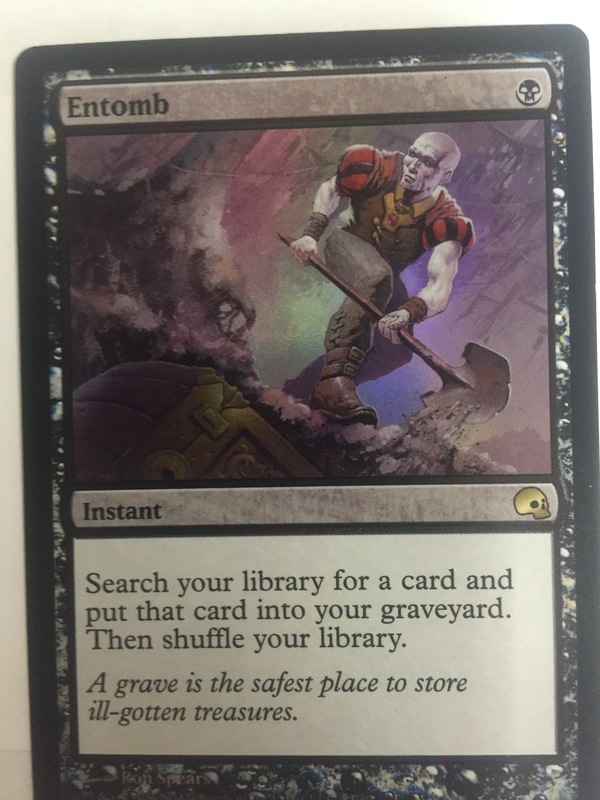 OK…Turn one, Entomb. Turn Two Reanimate. GG. At sorcery speed, and for three mana, you get entomb times three. SICK! A card from my early days of playing. I always thought it was bad. But it is great in this deck, where you need to discard things! As mentioned, this deck is a MONO BLACK deck. So you can’t cast this card from your hand…Crosis will have to be reanimated. But he is great! He is also the only legendary in this deck, surprisingly. I had this card from Commander. I always thought it good in esper colors. Pro Red and Green makes it great to entomb out at instant speed when needed. Onto what is in the deck box. The cards in cellophane and inserts in cellophane. I just threw away the insert which is a general guide to playing Magic. I am keeping this insert. 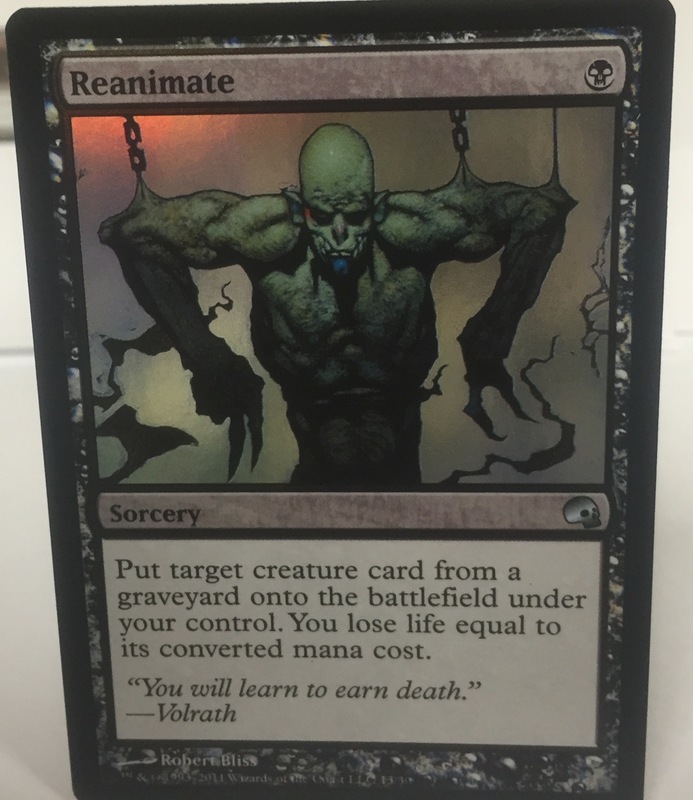 The historical information here is pretty nice to know…I wasn’t aware of who was successful with reanimator decks before. The decklist is on the other side. Good for future reference when I piece out the deck for different purposes. I am going to go over the cards a little at a time. Blazing Archon is probably the most annoying! 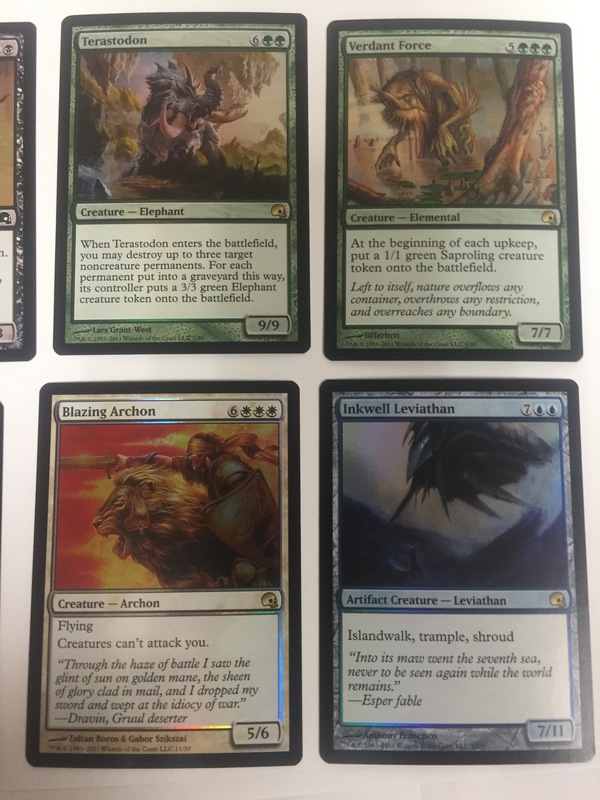 Casting Terastadon late enough in the game means you probably have Terastadon plus three elephant friends! Inkwell Leviathon. Great against blue players. Verdant Force is here not only as a bomb, but also for historical significance, if you pay attention to what they told you in the insert. There are also black creatures you CAN hard cast. Faceless Butcher is a black Banisher Priest. And Twisted Abomination rides the line between bomb and chump for this deck. He is better for swampcycling. You might find him to be the only “bomb” you can reanimate on a bad occasion. All spells are singularly focused on discarding or getting bombs out of the library and into the graveyard. There is no cancel or burn. No ramp. No pump. Just all re-animator business. 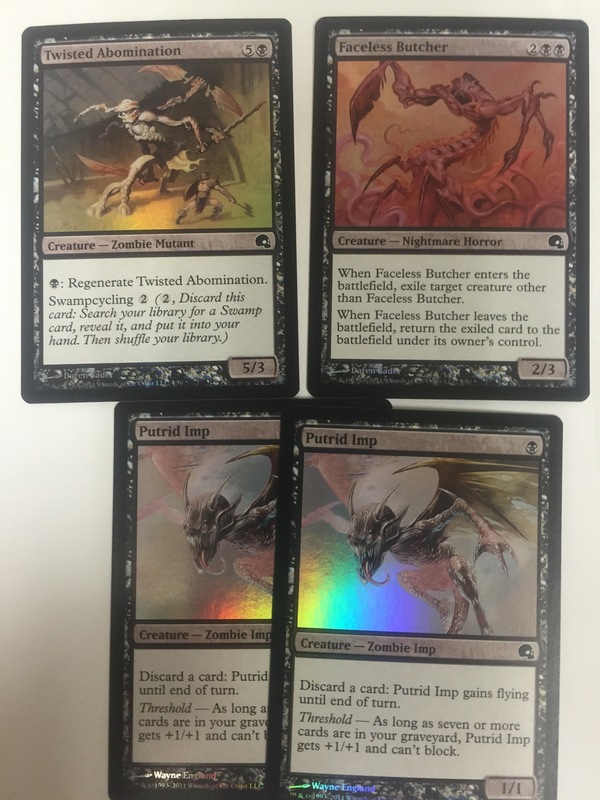 I am highly impressed with the foil on Duress. I mentioned before that Duress is one of my favorite spells! 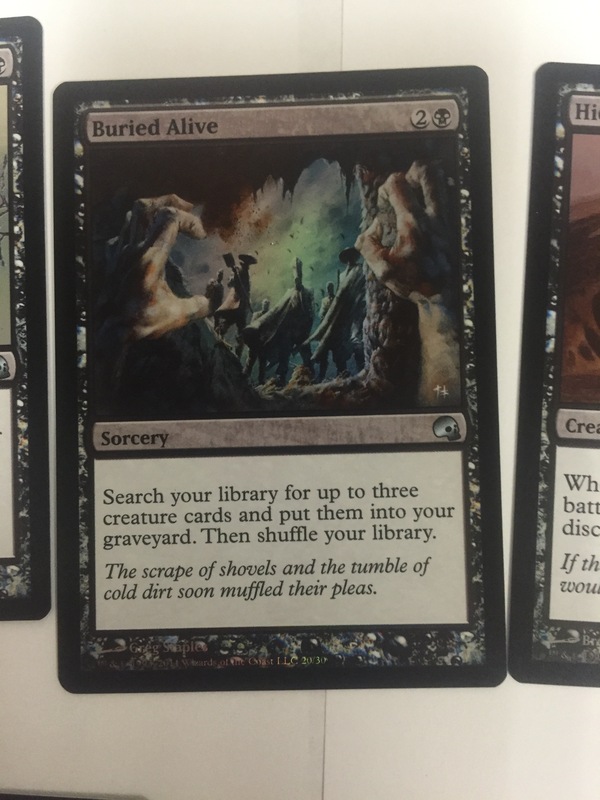 It is funny when you play Exhume on turn two against someone who hasn’t played any creatures. Diabolic Servitude and Animate Dead are about the same thing. 21 foil swamps. Just about enough said! The other three lands are utility lands that let you do colorless mana or sac for ramp. There is also a cycling land. Dakmor Salvage would be good here. Get your bomb in the graveyard early…and bring them back to life. Swing in for damage. Rinse and repeat. 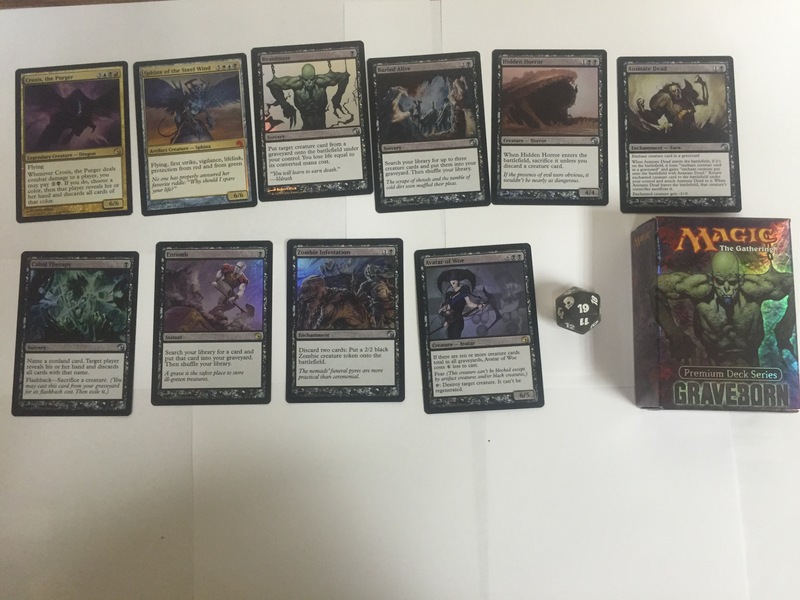 I played this against the SpartanKid, piloting various decks from the Dual Deck Anthology. The first deck I wanted to try it against was Divine, from the Dual Decks Anthology. Because that deck is generally a winner. A good matchup. But almost without fail, GG for Graveborn by turn 5. Chandra’s deck From the DDA was an interesting matchup. 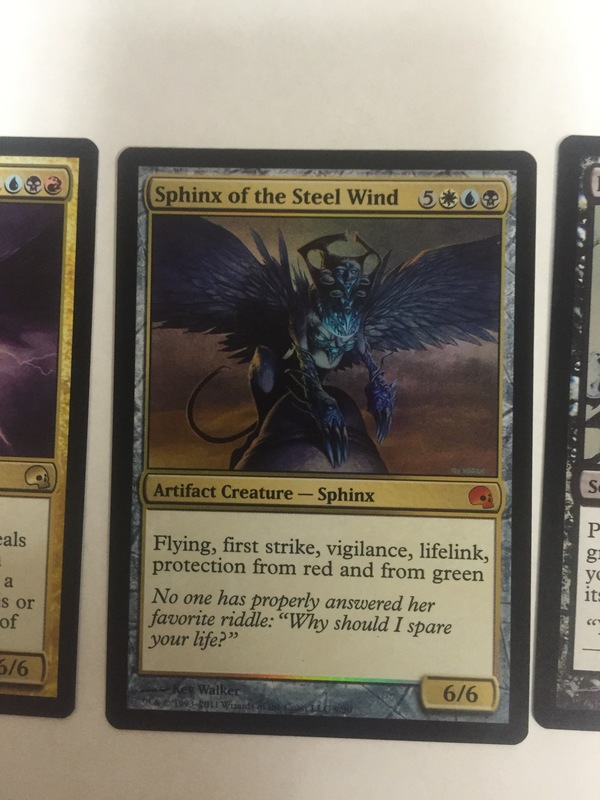 Burn is meaningless against Sphinx of the Steel Wind on Turn three. All of the progress Chandra could bring was just displaced by the giant, lifelink, vigilance, first striker. But Jace from the DDA was a different story. If the reanimator spells get canceled, this deck does nothing. And worse, if the bombs get bounced back to your hand, you have to work to get them back to the graveyard to reanimate. Graveborn lost two matches to Jace Beleren’s deck. And it was mostly because trick creatures with morph redirected spells, or bounced things. Because this deck is Legacy, I will have to modify it for play. I am thinking about how to use it in Standard. But that is really probably out of the question. The Whip of Erebos is good, except the cards brought back from the graveyard to swing are exiled after they leave the battlefield. Rescue from the Underworld is a mana-intensive spell. I am going to experiment some before the Standard tournament at the Tangled Web on Friday night this week. But I suspect I will just sleeve up my foil Duress cards and foil lands and continue to play Liliana/Waste Not. The other way this deck can be modified is by changing the bombs. Since 2010/2011 a lot more cards have been released. You can re-animate Iona, Shield of Emeria, and break your opponents colors. You can re-animate Emrakul, the Aeons Torn or other Eldrazi. Avacyn Angel of Hope and Akroma Angel of Wrath are good choices. Re-animate Aurelia and take extra combat steps. Reanimate Ashen Rider and remove a threat…Reanimate Medomai the Ageless and take an extra turn. 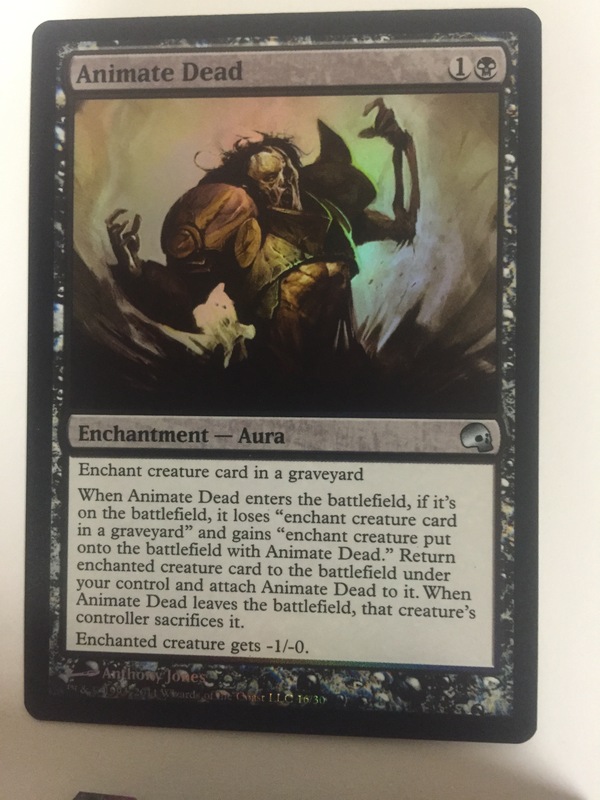 Reanimate Griselbrand…Reanimate …….. any Titan…. So many broken things to do! 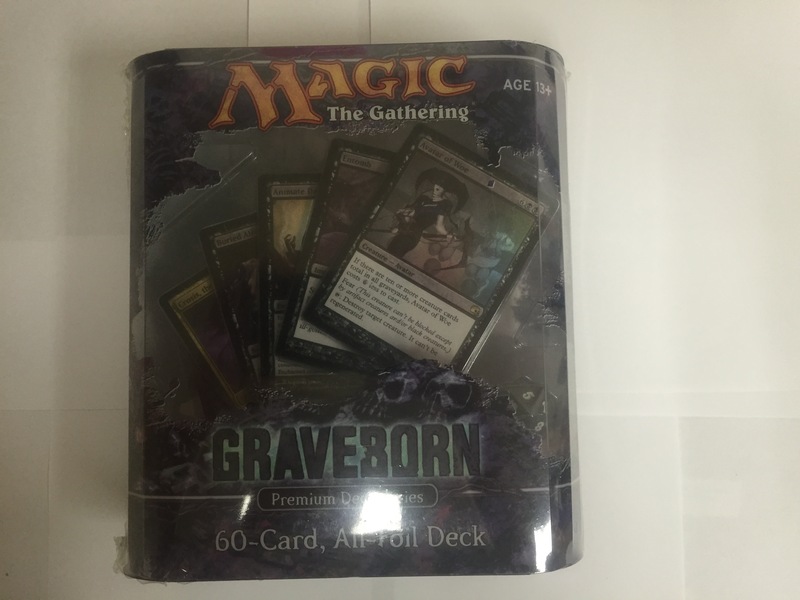 SpartanNerd’s Rating of Magic the Gathering Premium Deck Series Graveborn is 4/5. Here’s why. The foil cards look incredible. The deck is fun and consistent. The Spindown Counter is unique and cool, if a little different. The special insert with historical information was cool. There is a lot of monetary value here as well, especially with “entomb”. The deck box cannot hold the deck when sleeved with Dragon Shields. And these premium foils demand to be sleeved. I felt really paranoid I was going to scratch them by their rubbing together in the most natural way that cards do. This is a Legacy deck, and in my area, I have never seen a Legacy tournament. I have encountered players who brought decks to practice with. But I can’t just take this item to a local tournament and playtest it against a metagame. And then, the single-mindedness of this deck is also its downfall. If someone can prevent you from…Discarding cards, tutoring cards to the graveyard, or reanimating cards, all three of which are required to make this deck work like the organic machine it is, then that person will win. There is no sideboard included. But saying all of that negative stuff doesn’t detract from the sheer coolness of the deck. It is something most people won’t see coming. 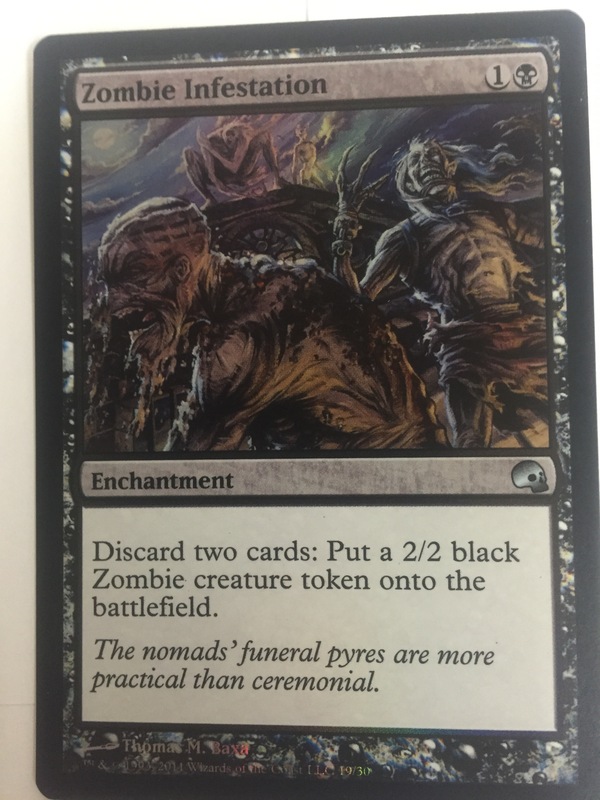 I ordered it for its beauty and for what it stands for, and for a way to help me do more things with the graveyard, and this deck has delivered this. SPARTANNERD’S RATING OF “GRAVEBORN” IS 4/5. DO YOU AGREE OR DISAGREE. LEAVE NOTES IN THE COMMENTS, OH HUB CITY GEEKS!